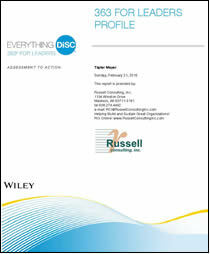 DiSC® – Everything DiSC® 363 for Leaders – Russell Consulting, Inc.
Everything DiSC 363 for Leaders – Assessing Your Leadership Effectiveness. Everything DiSC 363 for Leaders® is a powerful 360 assessment process with an extra punch: leaders get feedback on their DiSC style as well as rich behavioral feedback on eight leadership dimensions. After you purchase this assessment, we’ll send you an e-mail to get your 363 process set up. Each participating leader will complete an Excel spreadsheet where he or she identifies his/her boss, direct reports, peers, and others (at least three in each group other than manager). Once the leader forwards this to RCI and RCI uploads this file to the 363 survey website, the 363 process is ready to go! For the price of this assessment, RCI guides each participating leader in gearing up for the 363 feedback process, manages all communications with 363 respondents, compiles the 363 report, and provides a 90-minute phone or Skype-based coaching session where RCI walks the leader through his/her report and helps interprets the results. Leaders will create a leadership development plan based upon the 363 feedback and can receive additional coaching assistance from RCI for an additional cost. Contact RCI for follow-along coaching details and costs. Within 24 hours after you place your order, you will receive an e-mail with instructions on how to get things moving forward on your 363 leadership assessment. Note: Since Everything DiSC 363 for Leaders® is delivered to you online, if this is the only thing you are ordering from us, simply ignore the “Please Choose Shipping” when checking out.